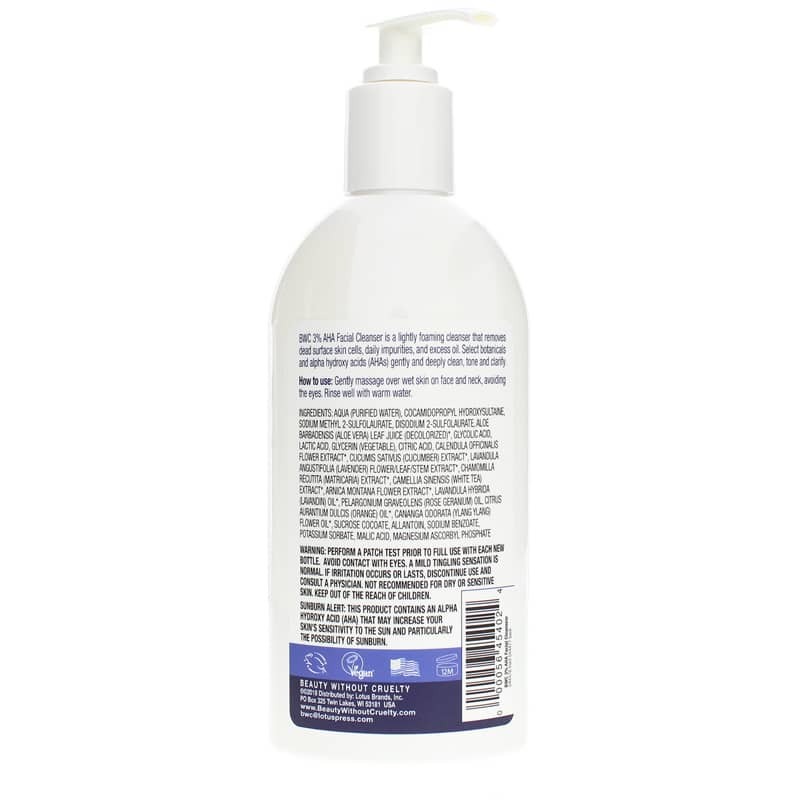 BWC (Beauty Without Cruelty) Aromatherapy Facial Cleanser with 3% Alpha Hydroxy Complex is a lightly foaming, soap-free cleanser that effectively removed dead surface skin cells, daily impurities, and excess oil without over-cleaning your skin. BWC benefits normal to oil skin types. Nature's own alpha-hydroxy and beta-hydroxy acids gently and deeply clean and actively clarify your skin without disturbing its natural balance. This wonderful facial cleanser contains pure, aroma-therapeutic essential oils tone, condition, and calm - leaving your skin clean, clear and refreshed. All BWC hair, skin, and body care products are 100% vegan/vegetarian. They contain 100% pure, Oshadhi essential oils (unless the product is fragrance-free). BWC never uses synthetic fragrances, parabens, SLS, animal-derived ingredients, or animal-testing. Purified water, Aloe barbadensis (decolorized) (aloe vera) leaf juice*, sodium C14-16 olefin sulfonate, cocoamidopropyl betaine, sodium lauryl glucosides, hydroxypropyl sulfonate, Lavandula hybrida (lavandin) oil*. Pelargonium roseum (geranium rose) oil, Citrus sinensis (sweet orange) oil*, Cananga odorata (ylang ylang) oil*, Lavandula angustifolia (lavender) extract*, Calendula officinalis (calendula) extract*, nthemis nobilis (chamomile) extract*, Lonicera fragrantissima (honeysuckle) extract*, Cucumis sativus (cucumber) extract*, panthenol, allantoin, magnesium ascorbyl phosphate, glycerine, glycolic acid, malic acid, citric acid, tocopherol, sodium benzoate, potassium sorbate. To use: Rinse face with warm water. Apply cleanser to face with fingertips. Gently massage over face and neck. Rinse thoroughly with warm water. Pat dry with soft cloth. Sunburn Alert: This product contains an alpha hydroxy acid (AHA) that may increase your skins sensitivity to the sun and particularly the possibility of sunburn. Perform a patch test prior to full use with each new bottle. Avoid contact with eyes. A mild tingling sensation is normal. If irritation occurs or lasts, discontinue use and consult a physician. Not recommended for dry or sensitive skin. Keep out of the reach of children. So glad to find BWT cleanser (blue label) here since Publix Greenwise doesn't seem to carry it anymore. Effective and very reasonably priced. Great face wash that does not bother my skin at all. Leaves my face soft and supple feeling. I have been using BWC for years. They are made with organic ingredients and contain essential oils - leaving skin clean, clear and refreshed. I am very happy with this product.